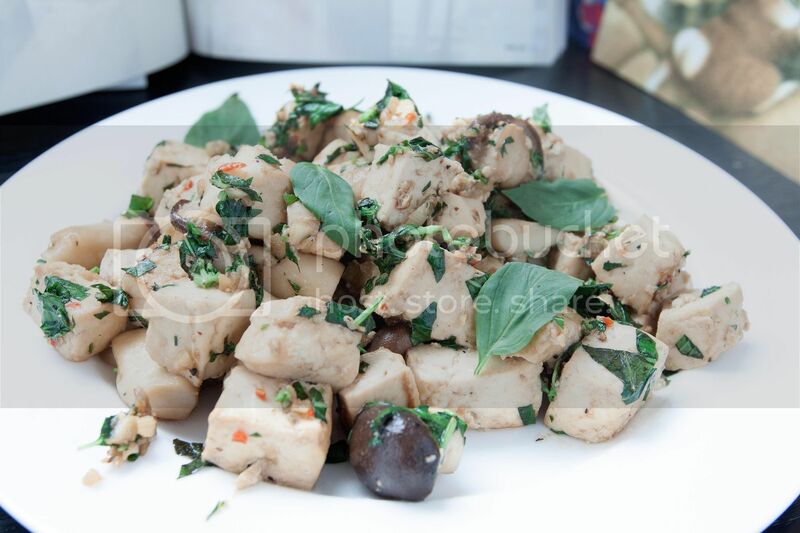 Plain, light, and healthy are the usual impressions about tofu. But with selected seasonings and even aromatic herbs, it can be a rice killer ingredient too, like this stir-fry with Chinese basil. 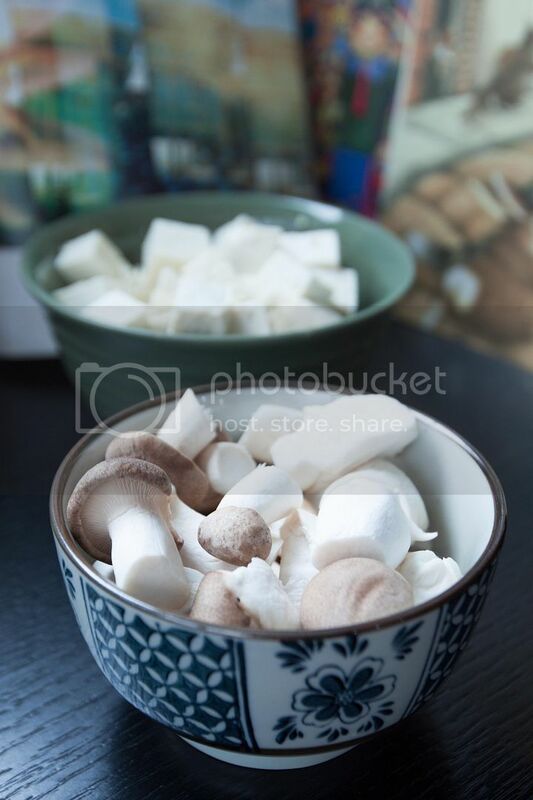 Cut the king oyster mushroom into medium sized chunks. 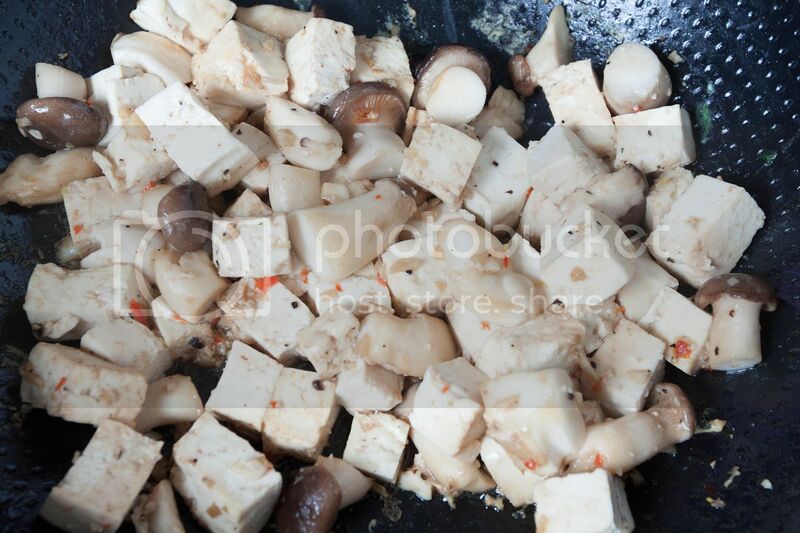 Remove the tofu from the box and drain out the liquid, cut into medium sized cubes. Peel and chop the garlic cloves. Destem and slice the chilies diagonally. Finely chop the basil, but do save some whole leaves as garnish later. Drizzle some olive oil to the pan and turn to medium high heat. Add in chopped garlic, chilies, salt, and pepper. Sear till aromatic but not burning the garlic pieces. Add in the mushroom and sear for about one minute. Add in drained tofu cubes, sear for another minute. Add in the soy sauce, oyster sauce, rice cooking wine, and sugar. Mix gently and sear till the whole thing appear nearly dried up. Add in chopped basil and cook for a little bit longer. Lastly, add a few splashes of sesame oil and give the whole thing a few flips. Plate and garnish with Chinese basil leaves. The key here is to "shovel" the tofu instead of "stir-frying" it. Otherwise the tofu might fall apart even we are using firm tofu here. Also make sure to fully drain out the liquid from the tofu. Pat dry with paper towel if needed to prevent any residual moisture diluting the flavors. 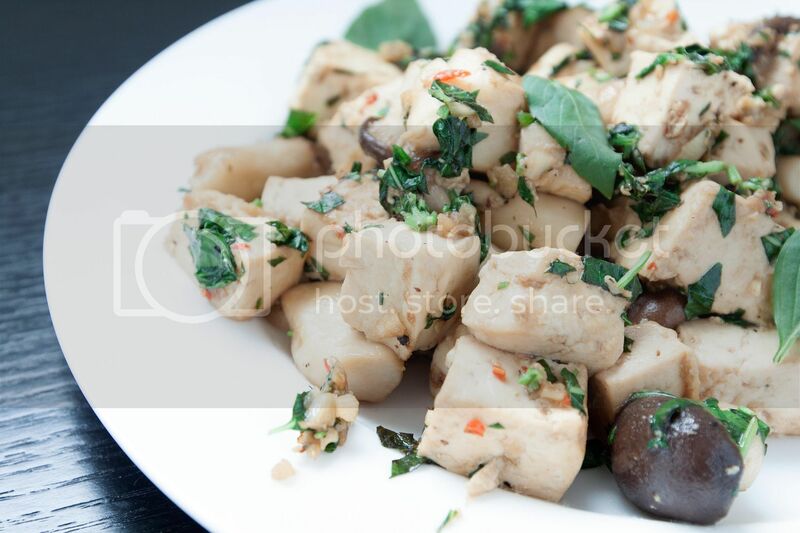 Who said tofu was boring? Think twice.